It's finished! I know I tend to take pictures of my feet, but in this case I only did to create a sense of scale. (Although I suppose that's not helpful, because for all you know I might have abnormally small or large feet... [I don't though, they are fairly average].) The rug ended up 40 inches in diameter. The wool trimmings I cut from the selvages filled a plastic bag, and I only had a tiny bit of the selvage leftover (you might be able to see the mini ball by the crochet hook) once I finished the last row. .... continued with this pattern, adding one more sc between (2 sc) in each round, up to (sc 11, 2 sc). I also tried to stagger the increases (2 sc), for a more round shape. It crocheted up fairly quickly even though it was a bit of a workout for the arms! It was also a lot of fun using the massive 25mm hook! 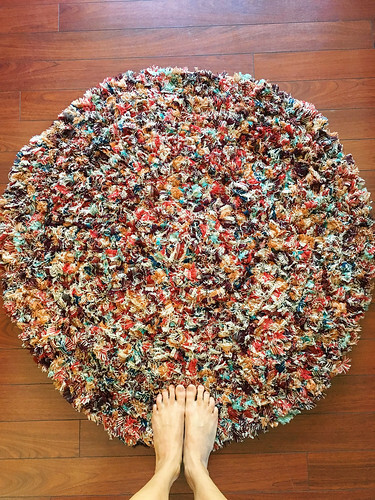 Have you made any rugs? So beautiful! Love it. Looks so soft & cushy! Thank you! It is quite soft and cushy!! 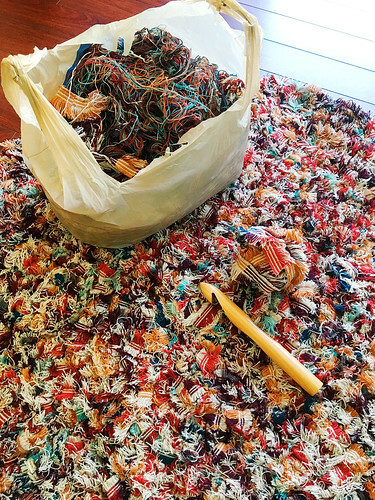 Well you certainly got that rug finished in double quick time with the huge crochet hook. It looks so snug! Winter is coming! I love it! Where in the world do you get wool selvages? ?